Hop on a DoDublin Hop On Hop Off Sightseeing Tour and see the very best Dublin city has to offer. We provide live commentary tours and also multilingual tours in 10 different languages. Experience all the attractions the city has to offer including Kilmainham Gaol, the Guinness Storehouse, Dublin Zoo, Dublinia and many more. DoDublin is Dublin's No.1 Sightseeing Tour since 1988. Our tours the most comfortable and most enjoyable way to see Dublin city. We have the biggest fleet of buses, and the DoDublin tour guides are Fáilte Ireland Trained and specialise in delivering entertaining tours with a unique blend of cultural and historical commentary, as well plenty of jokes and songs. Our tours offer great value and big savings for visitors on a budget. We are the cheapest hop on hop off tour in dublin with our great free giveaways and beat all our competitors in terms of the value we provide. Kids under 14 go free*, so from only €36 (including online discount), two adults and four children can have a fantastic day out in Dublin! Whether you want an overview of the City and its history, a guided Day Tour to spectacular destinations on the county’s north or south coast, or a trip to the dark side on the famous Dublin Ghostbus Tour, we have something for you. *2 Kids under 14 go free with each paying adult. Offer does not apply to group or discount bookings. The DoDublin green bus is famous in Dublin. Our guides are the best in the city & will show you Dublin like no one else can. We'll help you DoDublin like a Dubliner! Discover the Dark side of Dublin on the Ghostbus Tour. Join us for the best night out in Dublin. The Malahide Castle & Howth Tour. Fly to Dublin Airport with the Airlink Express 747 and 757 via the Port Tunnel. With over 250 departures daily. The Guinness Storehouse is Stop 22 on the DoDublin sightseeing tour and is one popular with all visitors to the city and Dubliner's alike. The St James' Gate Brewery was founded in 1759 by Arthur Guinness and the company still hold a 9000 year lease over the property. The storehouse explains the history of the world reknowned porter and while there why not enjoy a pint yourself. The 360 degree 7th floor Gravity Bar offers incredible views of the city as well. With an estimated near 1.5million visitors last year the home of the black stuff is definitely a stop we highely recommend paying a visit to. Check out our Hop on Hop off tour & Guinness combo and save €6 on your next trip. 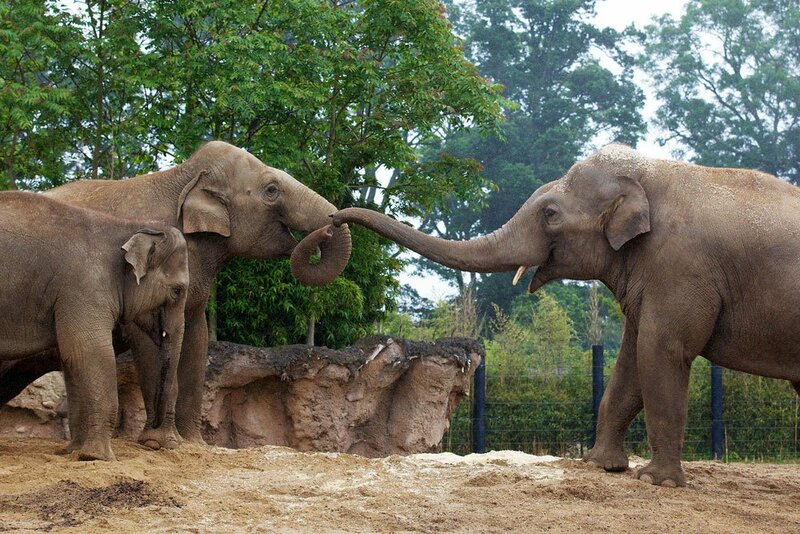 Dublin Zoo is Ireland's oldest and largest zoo, and is stop number 27 on our tour. Opened in 1831 the zoo is one of the largest in the world. It is also the second most popular tourist attractions in Dublin with 1.1 million visitors. The zoo offers a wildlife experience on the doorstep of the city centre with many exhibitions designed to look as similar as possible to the habitats lived in by the animals in the wild. The zoo is also the birthplace of a very famous lion. The lion that roars at the beginning of the Metro Goldwyn Meyer movies (MGM) is a native of Dublin Zoo named Slats. Pre-book your tickets to the zoo today by visiting the Dublin Zoo website. Opened in 1592 Trinity College Dublin is the oldest university in Ireland and is stop number 16 of the Hop On Hop Off tour. The College is home to the very famous Book of Kells. The book which last year recieved an estimated over 750,000 visitors is located in the College's Long Hall Library. The manuscript which was written by Irish monks based on the four gospels of the New Testament around 800 AD sits in the magnificent bulding that is Trinity College. Dublin's third highly ranked most visited attraction is just a stones throw away from our Hop On Hop Off bus stop at College Green.